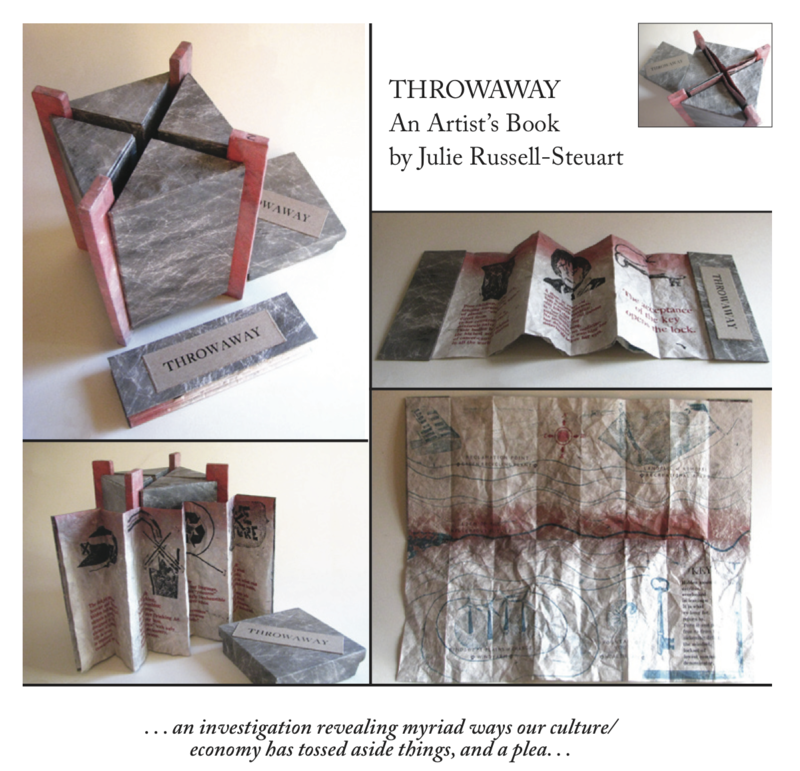 Throwaway, an artist's book by Julie Russell-Steuart, is an investigation revealing ways our culture/economy has tossed aside things. Title #99 of 100 taken from An Exercise for Kurt Johannessen (2010), by permission of the author, Sarah Bodman. Throwaway (2013) by Julie Russell-Steuart explores ways in which our culture/economy tosses aside things. With permission from http://wearethe99percent.tumblr.com, two people’s stories have been adapted poetically. “Throwaway” materials like cereal boxes and string were used to make pressure prints on hand-painted DuPont Tyvek, a spun polyester material that is 100% recyclable and safe for landfills. The format is an accordion style booklet that opens up on the other side to a map style folding.The text is letterpress printed with hand-set types in English Caslon Oldstyle 37, Century Bold, Della Robbia, and Style Script. The box enclosure was constructed with the design and engineering skills of David Steuart, and is made from boards covered in hand-painted Tyvek.